Since I knew way ahead of time that I would not be able to attend BEA this year, I had a chance to prepare myself to miss out on all the enticing ARCs I knew would be available there. But truthfully there were only a handful that I really moped over, and Forever was pretty much at the top of the list. The Wolves of Mercy Falls trilogy is one I've thoroughly enjoyed. When it comes to the absolute glut of YA paranormal romances out there, this series stands head and shoulders above the pack, if you will. And, as I've said before, it's all due to Maggie Stiefvater's exceptional prose and the understated nature of her storytelling in general. I end up walking away unsatisfied from so many paranormals these days, that it is with not a little relief that I look forward to each of Maggie's releases. I really cannot wait to get my hands on her upcoming The Scorpio Races. But Sam and Grace have been on my mind since the end of Linger, and I may have done a little dance of joy when this ARC showed up in my mailbox. In any event, every other book in the house immediately went on the back burner as I cozied up with Sam and Grace (and Isabel and Cole) to see their story through to its conclusion. A warning: This is the third and final book in a trilogy so take heed. Beyond this point, there be spoilers. Waiting. That's what Sam's life has become. One unending series of days and nights in which Grace isn't there. In which the "normal" inhabitants of Mercy Falls stare at him suspiciously, wondering just what he had to do with the mysterious disappearance of more than one hometown girl in the past few months. And while the girl he loves is off discovering the furrier side of life, Sam is left at home to take care of things. To take care of Cole. And Isabel. And the bookstore. Except Sam is not up to doing much taking care of anything these days. And so Cole fills Sam's silences up with any noise he can find. And when blasting old NARKOTIKA tunes as loud as the speakers will go fails to rouse Sam, Cole calls Isabel's cell phone and leaves one more in an endless string of unanswered messages. And Isabel sits at home, barely suppressing the anger that seems to fill her to bursting these days. But just as Sam before her, Grace's shape is now ruled by weather, and it's only a matter of time before the missing girl comes back. In the meantime, Sam must get through another day without her and without Beck. Isabel must negotiate her increasingly militant father's calls for a wolf hunt in Boundary Wood. And Cole must see if he can put his long dormant intellect to good use finding a way to save them all. "Sam. God, am I talking to myself?" Over the line, I heard the chime cars made when a door was opened. And then a sharp intake of breath as the door shut. I realized I was being an ingrate. "I'm sorry, Isabel. It's just been--it's been a really long day." "Tell me about it." Her feet crunched across gravel. "Is he all right?" I walked the phone down the hallway. I had to wait a moment to let my eyes adjust to the pools of lamplight--I was so tired that every light source had halos and ghostly trails--and waited for the requisite rise and fall of Cole's chest. "Yes," I whispered. "He's sleeping." "More than he deserves," Isabel said. I realized that it was time to stop pretending to be oblivious. Probably well past time. "Isabel," I said, "what went on between you two?" "You aren't my business." I hesitated. "But Cole is." "Oh, Sam, it's a little late to be pulling the authority card now." I didn't think that she meant to be cruel, but it smarted. It was only by imagining what Grace had told me of Isabel--of her getting Grace through my disappearance, when Grace had thought I was dead--that kept me on the phone. "Just tell me. Is there something going on between you two?" I heard the real meaning, and maybe she meant for me to. It was a no that meant not at the moment. I thought of her face when she saw the needle beside Cole and wondered just how big of a lie that no was. I said, "He's got a lot to work through. He's not good for anyone, Isabel." She didn't answer right away. I pressed my fingers against my head, feeling the ghost of the meningitis headache. Looking at the cards on the computer screen, I could see that I had no more options. The timer said it had taken me seven minutes and twenty-one seconds to realize I'd lost. "Neither," Isabel said, "were you." Good stuff, huh? The exchanges between Cole and Grace are just as good, and I found myself charmed by Cole's reaction to Grace and by the unexpected connection they form. I loved how large a role Sam's history plays as well. I didn't even realize I'd been craving more on his relationship with Beck and the other wolves who raised him, but apparently I was as I absolutely ate up the exploration of how his perceptions of the past worked on him now. That said, my emotions weren't quite as engaged as they were in the previous two books. The stakes didn't feel as high. One of the things I have always loved about this series is that it's quieter and not showy on the whole, yet it packs such an emotional punch. And it's not that there was a lack of tension this time (the final chapters rev their engines nicely), but rather that the various threads of tension didn't seem to coalesce quite right by the time the climax came around, with the result that I was a bit surprised when I read the last sentence and turned the page to find there was nothing more. Rest assured, however, that the writing is as beautiful as always. And I was left with a palpable sense of longing, which may in the end be the perfect result for this elegant series that has been so full of the ebb and flow of both love and loss. 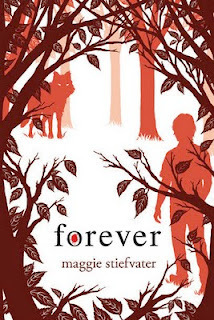 Forever is due out today. I read Shiver when it was first released and really wasn't overly impressed by it. Your high praise makes me think I should give it another try! Ooh, lovely review as always! The quality Sam/Isabel and Cole/Grace exchanges you described have intrigued me. I loved the addition of Isabel and Cole in Linger so I'm very excited to see where they go. I loved the Cole/Isabel interaction in this book as well! And Sam's failure to step up to the bar was a little frustrating to me, but I loved the way Cole matured and stepped up himself. And the loss of B--- just killed me; I hated that! Very bittersweet. Great recap - thanks for the lovely review! wish they would make a book for isabel and cole. they stole my heart with their romance. a lot of people would love for maggie to make a book for isabel and cole.they are so adorable and i cant get enough. be hooked to the very last page.